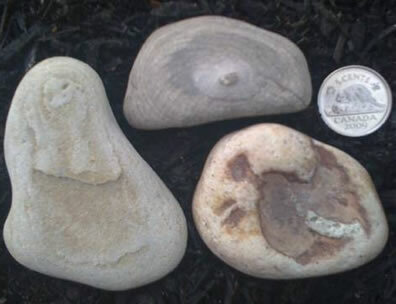 I found 3 natural image stones in the rivers of the rocky mountains by our home. I believe these are messages from spirit, as I ask for signs when I go walking. Eagle head (symbol for messenger, freedom), grim reaper, angel. I believe these are messages for us that show up in random, simple objects.They are real, made by spirit/mother earth. Yes you can use this post. reply: Since I don't believe in spirits or in mother earth as an intentional agent, I can't agree with you that spirits are answering your request for signs (of what?) when you go walking. Around here we refer to seeing eagle heads, grim reapers, or angels in stone stains as 'pareidolia' and we refer to giving significance and intentionality to random stains on rocks as 'apophenia.' These are not diseases but refer to the all-too-human tendencies to find a personal connection with impersonal noise and to see patterns where there are none. Nice stones, though.